The tasting menu began with Buffalo brain lollipop, continued with buffalo tartar and roasted bone marrow mixed by hand with quail egg yolk, and later featured buffalo tongue and cheek… Certainly not an average Cape Town dinner out. But then an invitation to a chef’s table at The Roundhouse means culinary experimentation is to be expected. Chef Eric Bullpitt (formerly at Jardine) recently joined the kitchen team, and menu collaborations combine the culinary ideas of both Eric and fellow chef PJ Vadas. 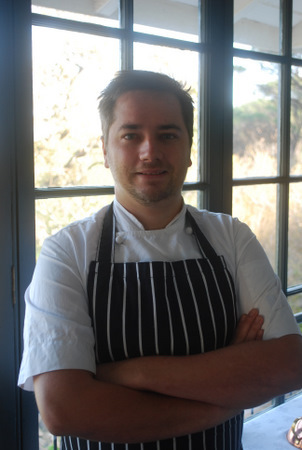 Vadas – San Pellegrino’s South African Young Chef of the Year Cooking Cup candidate for the 2011 competition in Italy - has moved into an exec chef/GM role. And it’s Eric you’ll find creating and testing at The Roundhouse on a daily basis. This special chef’s table showcased the efforts of Wellington buffalo farmer Wayne Rademayer of Buffalo Ridge mozzarella. Wayne had a buffalo going begging. And good chefs love the challenge of fiddling with bits and pieces - they’re anorakish like that. Wayne and PJ joined the dinner table. Would you believe that Wayne started his buffalo cheese production by flying over 21 cows and 3 bulls on Qantas flights originating in Victoria, Australia! Of 12 courses served, nine featured buffalo in some shape or form. We tried white, waxy buffalo butter mixed with Maldon salt, delicious. Cows also produced milk for cheese and yoghurt, while bull meat provided the rest. Buffalo brain was an oval poached, crumbed and fried, served with Belgian beer (If the thought of brains makes you squirm, the texture is creamy/mushy in a rich way so a crunchy contrast is a huge plus). I loved a buffalo tartar and roasted bone marrow combo – the raw diced meat was intense ruby red, hand-mixed with quail egg yolk and cooked, diced bone marrow, served on the clean bone. Eric’s “vegetable patch” of pampered miniature veggies featured the creamy mozzarella sold to the public. Other FlavourCape highlights? The unusual flavour trio of farmed cob served on velvety soft bulltail and creamed cauwliflower, with a beef tea consommé tasting of stock and unusual wormwood leaf, wild rosemary and thyme herbs. Buffalo shortribs with watercress had a beautiful jus sheen with liquorice notes. For fun, buffalo liver in caul fat ‘skilpaadjie’ with potato and a miniature charred ‘roosterbrood’. “Our take on the South African braai,” declared PJ. This meat-and-rugby-fan is curing buffalo biltong. A soufflé was impressive but my favourite dessert was panna cotta made with thick full-cream buffalo milk yoghurt, hitting the spot for just the right amount of creamy texture to its sweet-sour kumquat marmalade topping. Truly an inspired and inspiring meal. Eric claims to be an introvert who would rather let his food do the talking. With food of this quality and skill, I say let him continue. THE ROUNDHOUSE, Stans Holt, Kloof Road en route to Camps Bay. Tel 021 438 4347, Roundhouse This meal wasn’t open to the public but The Roundhouse plans to occasionally showcase supplier’s ingredients, in line with their philosophy of supporting small local farmers and artisan producers. Dinner a la carte: R420pp for four courses with options or R640pp for four courses including sommelier-selected wine pairings. May to 30 September 2011: Winter special Dinner: R240pp for seven courses or R460pp incl wine. Winter special Lunch: R180pp to select three courses from the dinner menu.